The farm of Montalto exists for over a century. Always owned by the family Gomes Pereira, all the successive generations that took charge of it succeeded in introducing benefits all over the farm, which contributed a lot to increase its value. The farm of Montalto was founded in the second half of the nineteenth century (1880) when Mariano Gomes Pereira Baptista (1858 – 1932) started buying, little by little, small stripes of land in order to enlarge the inheritance from his father Joaquim Gomes (+1889). Mariano Gomes was born in Corredoura - Vila Nova de Ourém and got married in Lisboa, where he owned a small shop. Later on, following an appeal from his heart and taking an opportunity, he left Lisboa behind and returned to his origins in the country, where he settled definitively. At those days the existing house was built according to a very representative Portuguese country style, being surrounded in the northern side by the road connecting Olival with Vila Nova de Ourém. Facing a wide scenery, the inhabited floor was just above the ground floor which was meant to lodge the agricultural implements and the stock raising tools. According to the customs of those days the house was humbly whitewashed but it had a wide dimension quite uncommon in the region. A flight of stairs in the façade allowed the access to a platform in an opened balcony where the main door seemed to invite the visitors inside. On the top of it, a simple enamelled door plate with the inscription “Montalto Vila Gomes” could be observed. The following generation is represented by Joaquim António Pereira (1881 – 1968) and his wife, Maria da Luz Gomes Pereira, the youngest daughter of Mariano Gomes. He was born in Ribeira do Olival where his father operated a water-mill, and he was still quite young when he decided to depart for Lisboa. As a result of hard work and the luck of winning the first prize in the lottery, he became a well succeeded breadmaking industrial. After the death of his father-in-law he bought the shares of the other inheritors and became the new owner of the whole property. He was a very good man, with an unparalleled character, and liked enjoying the farm every weekend, walking through narrow tracks, resting on a pair of canes when necessary, in particular when he became very old. During these walks, if he encountered, for instance, a dead fruit tree, he immediately wrote it down in his pocket note book with the purpose of warning the farm manager of the need of replacing that tree by an identical one. More than the profit his real motivation was the pleasure and the happiness of getting a little bit of every culture for his family. And in fact, in those days of relative plenty, almost everything could be found in the farm: chickens, rabbits, sheep, goats, cows and even a she-mule called Carriça; white and red plums, and cherries, morellos, quinces, apples, oranges, mandarin oranges, all variety of figs, and grapes, in particular those used to produce the famous wine “palhete”, very gluttonous but false in terms of alcohol contents; nuts, pine seeds, chestnuts, olives, pomegranates, apricots, and peaches, all were delicious; green beans, read beans, butter beans, cucumbers, pumpkins, melons, watermelons, peppers, lettuces, chicory, cauliflowers, cabbages, turnips, turnip leafs, carrots, red beets, garlic, onions, potatoes, chick peas, maize, wheat, rye and barley; parsley, savory, oreganos, corianders, basil weed and laurel; hortensians, lilies, gladioluses, gully-holes, roses, daisies, tulips, chrysanthemum and dahlias; all these products were consumed and very much appreciated by us, in Lisboa, even the flowers, which, of course, were meant to ornament the house. In the thirties the house was demolished and a new larger one was built in the same place, presenting features similar to the architectural style of Raul Lino. It kept an inhabited floor over a wine cellar with two wine-presses, but it was augmented with an attic surmounted with a framework of beams in order to bear the weight of the roof. The attic was very large expanding along all length of the house. In its eastern side some rough rooms separated by thin wooden walls were used both, for domestic activities, like laundering, and as sleeping rooms for the servants. In the northern façade, the main entrance was made through a flight of stairs mounting from the garden, quite close to the road, up to a covered porch. Still outside, in the eastern side, a protecting and blessing image of Nossa Senhora da Ascenção, in white and blue wall tiles, was placed in a quite visible place. The northern and eastern façades were surrounded by a well treated garden with flower-beds delimited by grass. A small stone defence crowned with metal pointed spears alternating with double edge halberds, separated it from the road. In the southern and eastern side, the landscape all over the valley and distant villages could be admired peacefully from a terrace with a baluster in concrete. Surrounding the main building, which seemed to be a yellow spot in the landscape, it could be seen a cluster of several small whitewashed cottages, the garage and the fruit store across the road, and towards the south, around a yard with orange trees and flowers, the farm managers’ home and the alembic house. Farther away, the driver’s and the shepherd’s home, the cellar, the stable, the corral, the coop and the pigeon house could be seen. Finally, a wide kitchen garden with fruit trees surrounded by a stone wall could be admired from the terrace. In the centre, a water tank made in concrete covered with grapevines in espaliers, that, besides adorning the place, was also used for watering purposes. The third generation is represented by the couple Filipe Gomes Pereira (1914-1997) and Gracinda Henriques Gomes Pereira (1912-2001). In spite of some formal antagonism, they were able to support each other and spent together an idyllic and, for sure, happy life, thus contributing to a quite enlarged familiar life which is still tenderly remembered by those who had the chance to be part of it. They were responsible for the construction of a swimming pool supplied with current water, with the dimensions of 17 * 5 linear meters and 4 linear meters of maximum depth. As it was, at that time, the only one in the region, it became an attraction to the families in the neighbourhood which used, like us, to spend there the holidays in September. They also transformed the barn floor in a playing field, where Croquet, Badmington and Volleyball were successively played in matches where the motivation was different. There were times to be sulky, to cry resentfully, to quit ragefully, it even happened that someone learned how to win only in moral terms, which means, obviously, to loose. So, it is possible to imagine that the fifties and the sixties were quite amusing, bringing together all the cousins (Jorge Ferreira, Lagoas, Gomes de Oliveira and others) and the families Acácio de Paiva, from Quinta da Serrana, Quinta dos Paços, Vila Nova de Ourém and so many others as the friends of our friends were also coming. In 1968, after a deep renovation, the house acquired the current aspect. Keeping approximately the same external size, all the interiors are transformed and rebuilt in order to obtain a better habitableness, making it more available and manorial. The attic is replaced by a floor with sleeping rooms and bathrooms, this way being upgraded to a real second floor. Brought from another property near Castelo Branco, which was received in heritance, some old pieces (XVIII th century) of stonecut granite were used to replace, with advantage, the concrete of the baluster in the terrace and of the water tank in the kitchen garden. 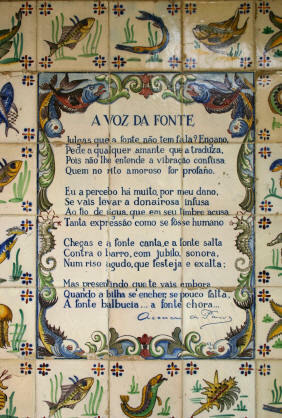 In the space under a staircase there is a fountain with multicoloured wall tiles from the factory Viúva Lamego, surrounding a panel presenting a marvellous unpublished sonnet from the poet Acácio de Paiva. As a result of agricultural policies, as well as of the increasing shortage and rise of agrarian labour force cost, the evolution in the last thirty years was marked by several attempts to generate income from these fifty hectares of land. It was decided to begin with cattle raising, more precisely pig breeding, and more modestly, poultry raising and rabbit breeding. With enthusiasm some of the installations were enhanced and other were built according to the standards at that time. For the purpose of pig breeding, some specimens of the Danish Largewhite were imported as well as Belgian Pietran, which was an innovation at national level. But still in the seventies, the plague spread all over the herds of pigs, and with the pig’s compulsory slaughter, the hopes also died. The rabbits disappeared progressively, and the aviary, though remaining some more years, also entered into a decadent phase. In face of the successive financial damages and the degradation of the farm demanding for urgent upkeep, it was decided to improve the replant of vineyards, aiming at profiting of the excellent oenological conditions of the region. Simultaneously, after a previous experience with Charolês bovines, it was decided to import directly from Germany, some specimens of Frísias bovines - some of them with a pure pedigree as a grantee of quality - and a new activity was launched, in a regime of half stabling. Once again the activity of cattle breeding was a source of concerns. The shortage of qualified work force, and mainly, as milk producers, the enormous dependence of the dairy industry, were the main reasons for a financial crisis that started when Ribacal went to bankruptcy, affecting considerably the patrimony. It is precisely at the dawn of the millennium that the fourth generation represented by the “Inheritors of Filipe Gomes Pereira” - this expression covering also the fifth generation which represents an essential help – starts assuming the responsibility of the management. Converted to the Organic Farming, now the challenge to face is the quantity and the quality of the plantation and replantation of the vineyard and the horticulture was also launched aiming at obtaining products of excellence. Though the wines are already a rewarded achievement, it is still early to write here on the results of the current projects as only the future may translate them into successful cases or mere fancies, that same future that the newcomers will be able to add to this past that we proudly transmit.